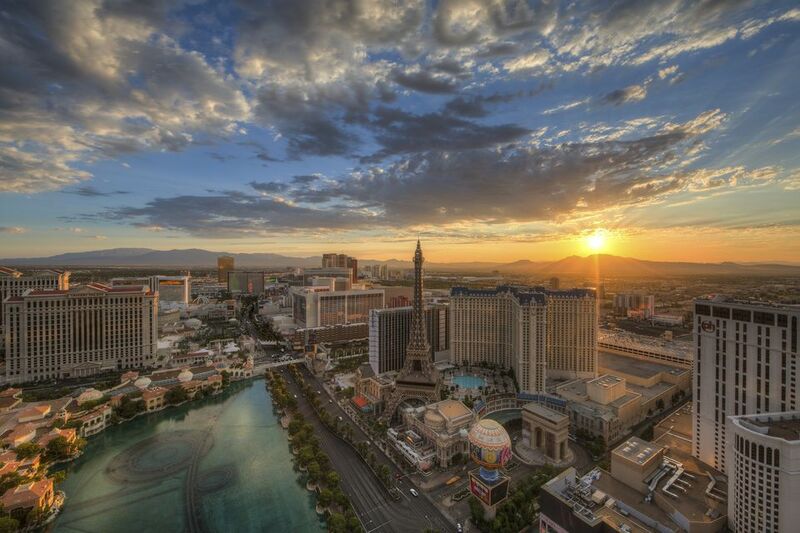 Capture the last remaining bits of summer in Las Vegas with a fall trip to the strip. October in Las Vegas means comfortable temperatures and more affordable shoulder-season hotel rates. Aside from the end of the month when Halloween hits, October is prime time for those wanting to avoid the crowds in the casinos. October is also the start of hockey season and the Las Vegas Golden Knights—the newest team in the NHL—are playing at the T-Mobile Arena. By October, the sweltering summer heat has worn off and left super comfortable weather to walk around. The average low temperature is 58 F while the high hits 81 F. During the day, expect lots of sunshine—the average rainfall for October was only 0.28 inches—and warm 70s weather. When the sun sets, the cool desert nights kick in and the temperature drastically drops to the 50s. October also wraps up pools party season, but the pools typically remain open until the end of the month. Because of this, you're more likely to have the pool to yourself, which is perfect for those looking for a quiet, tranquil dip over the high-octane, alcohol-infused pool parties that Sin City is known for. Because of the broad range of temperatures in October—from the warm, sunny days to the chillier nights—it's best to pack a variety of clothing. Bring light cotton shirts, dresses, and shorts as well as a sweater or shawl to throw on at night (or in the casinos, which usually blast the AC). If you plan on going out to a ritzy club or show, there is probably a dress code, so wear heels and a nice dress for women and a button-down shirt and slacks for men. Glitz and glam are not just accepted but embraced with open arms in Las Vegas. So don't be afraid to rock your jewelry, sequins, and colorful outfits. There's always something going down in Sin City. In October, you'll find a long line-up of shows, concerts, and holidays to celebrate. And if none of the seasonal activities inspire you, check out the Vegas mainstays like Cirque du Soleil, Blue Man Group, or Criss Angel Mindfreak. A-list singers and bands like Cher, Christina Aguilera, and the Backstreet Boys will be performing throughout the month. Valley of Fire State Park or Red Rock Canyon are both reasonably close and offer some fantastic natural sights during October. Halloween is one of the biggest parties in Las Vegas. Grab a costume and head to any hotel for a night of gambling, drinking, and partying. To learn more about traveling to Sin City, check out our guide on the best time to visit Las Vegas.